The Bugaboo Cameleon 3 was my dream stroller. This is the stroller that we purchased. And after trying all three strollers it is my favorite. In my opinion this stroller is worth the money. I love that it can be used three ways. The bassinet, with my car seat or with the seat once they are a little older. I used it mainly with the car seat. I bought the adaptor for the Nuna Pipa car seat and it is the easiest thing to use. Andi wasn't a huge fan of the bassinet and in my opinion the car seat is just easier for everyday life. Especially if they fall asleep in the car. This is my favorite because it is the lightest of the three and the frame is pretty small (obviously the bassinet is pretty big). I did not want a huge bulky heavy stroller. This stroller with the car seat is just so easy for everyday. It folds up so easily, it is light weight, it is pretty small so you aren't running into things in a store and it is so easy to push and maneuver. In my opinion there really is a difference in pushing this stroller verse others. It is very smooth and just very easy to push. It was also great for traveling. I feel like if you have this stroller it is really the only stroller you would need. Obviously I have others now because they were given to me. But I bought this one because I felt like I wouldn't need to buy an umbrella stroller. This one would do everything I needed. It also has a pretty good size basket which I really like. Now that we are using the seat I love it even more. Obviously I love that the canopy is pink. But it really is a great seat that can be reclined in three different positions and can face you or you can turn it outward. Also the wheels on this stroller are great. And you can just move the handle to have the little wheels in front or the big wheels in front if you walk outside a lot. Everything on this stroller is just easy. Its easy to fold up, to recline the seat to move up the handle. I think it is just really well made and well thought out. The Nuna IVVI would be my second choice! When I got this stroller Im not going to lie I was a little skeptical. But as soon as I started using it I really loved it and I have used this one so much! This stroller obviously is compatible with my car seat which is also Nuna. I just don't have a picture of it with the car seat on it. I love this stroller because of the seat. Andi LOVES this seat and you can use this seat with a newborn. We started using it when she was about a month old. It just looks comfortable and spacious for a baby. It has three different positions and it can face you or face outwards. Also this has the best sun canopy. It has a pretty big canopy but then you can unzip it and another part comes out that covers the baby completely, which is really big for us here in Florida since it is so hot and sunny. So we use that all of the time and it keeps me from having to buy any other kind of stroller cover. I also love the basket on this stroller. It is even bigger than the Bugaboo. In comparison to the Bugaboo this stroller is much bigger and bulkier. It is also heavier than the Bugaboo and just takes up a lot of room in the car. It almost feels like you could go off roading with this stroller if that makes sense. I can really tell a difference when pushing the two strollers this one is much rougher of a ride (which can be good for getting a baby to fall asleep, as sometimes the bumpiness actually helps the baby fall asleep). It is not as smooth or as easy to maneuver as the Bugaboo. Also it is bigger and since I am used to the bugaboo when I use this one I feel like I am always running into things. That being said I do really love this stroller and use it all of the time. I would highly recommend it. This is a really well made stroller and I think this is also worth the price. This one is a little cheaper than the bugaboo. The Stokke Explory is by far the coolest looking of the three but it is my least favorite. It is still an amazing stroller but for me it is just not my favorite. I also bought the adaptor for my car seat so that I could have that option. But the adaptor for the xplory is much harder to put on and use than the bugaboo adaptor. Once she was big enough for the seat I found that I really liked this stroller much more. I think this stroller is just very cool looking. It is so different than any other stroller out there. I love that she is so high and close to me in this stroller. That really is one of the best things about it. I also love that this can pretty much be used as a highchair if the seat is facing outward because it is so high and can just be pushed right up to the table. I like the seat and the sun canopy. Both are very steady and well made. One thing I don't like about the Bugaboo is the sun canopy is a little floppy, but this one is the complete opposite and I love that. Everything on this stroller is pretty easy to use. I do not like that the Xpory has basically no storage. This is the main reason why I don't use this stroller. I really need some kind of basket. I always have a million things. Also it is on the heavier side in my opinion and is pretty big. It doesn't fold down all that much so it takes up a lot of room in my car. I don't know if this stroller is worth the money. It is very cool and has a lot of great things about it but in my opinion it isn't realistic for everyday use. At least not compared to the other two strollers that I have. I use this one the least. It is still a really great stroller of course! I hope this was helpful. I think one of the questions I get asked the most is which stroller do I like the best? And I have been meaning to do this post for a really long time. If you have any other questions or I missed something feel free to email me. I am so lucky to be able to try out all of these amazing strollers. I would obviously be happy with any of these if I only had one. And I do love different things about all of them. I don't have a kid so I don't have a need for strollers quite yet haha but great reviews and I LOVE all your outfits! http://trendkeeper.me .. 50 shades of BLUE! Love seeing reviews of different strollers. It's so hard to decide which ones are best when you just go into the store! Yes, it is hard to choose the best one from lots of brand. But, before pick your stroller you need to think about some requirement or, what kind of stroller do you want? Do you need best travel stroller or, you are looking for best lightweight stroller. 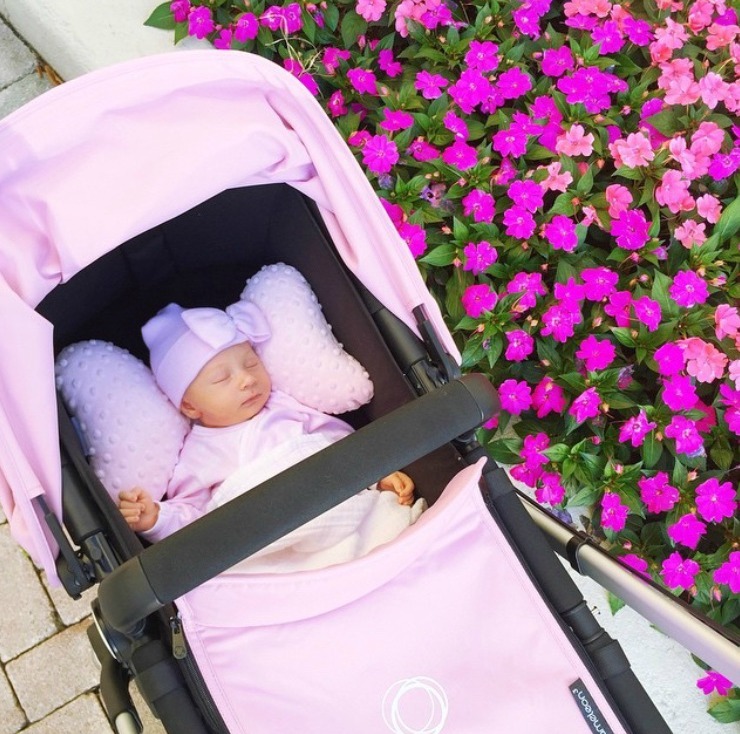 Personally, I am using this Bugaboo Cameleon 3 and I am happy from my mind by this performance and it is able to fulfill your need for a lightweight and travel stroller. asked on insta but I realize you get a lot of comments so they're easy to miss! Wondering where your first dress is from, the pink one :) SO cute! Hi Jade, I just wanted to let you know that your Chameleon canopy should be a lot more taught than that. I think you might have an issue with the clamps that attach the canopy to the frame. When you pull the canopy forward it should stay, not drop back a bit like it's pictured in your photos. Just thought I'd mention that since that was one of your cons, and being a Bugaboo lover and baby store owner I couldn't let it go without letting you know ;) Contact customer service and explain your issue and they'll send you a replacement part for free since you're under the 3yr warranty. Hope this helps! L.
Jade, where did you get the bow shaped pillow that Andi is using in the picture of her in the bassinet? Hi there. Does the Nuna adaptor fold well with the bugaboo? Or does it need to detach before folding?